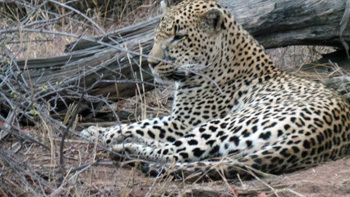 The Leopard, Panthera Pardus is, for many tourists, the most sought after animal in Kruger Park. It is the quintessential cat, displaying qualities so familiar to humans who have house cats : it is aloof, able to climb tall trees, opportunistic and generally solitary. Perhaps the greatest allure of the leopard is its beautiful coat – distinctive individual markings that provide a rich tapestry of the finest colours. Indeed its coat is also its potential greatest weakness as both ostentatious ladies and pretentious tribal elders feel an urge to wear it. We all know that the coat looks better on the leopard than on any vain and arrogant human ! Beautiful specimen I saw near Ezulwini Lodge. The leopard’s strength is its ability to survive in different climatic zones and its catholic diet: leopards can kill and eat anything from a small bird or rat to animals as large as a young giraffe. 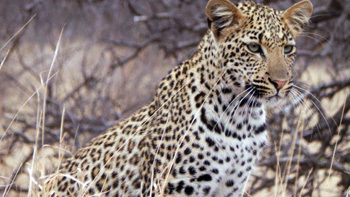 In South Africa leopards are even found near urban areas around Cape Town and Pretoria. Hello – Halala again ! Walks around the river area – it’s the best – we saw hippos ,crocodiles ( one of about 5 and half metres). Sunset drives usually started off with sightings of elephants, impalas, kudu and giraffes. After the sun goes down we start to see the odd bush baby jumping from one branch of a tree to another. Around Marula Boma we often see buffaloes. While eating at the Bush BBQ we have been joined by hyenas, genets and honey badgers. Sometimes the bush can surprise you. On one drive it was quiet and my guests asked me how long I have been guiding ! They were asking that because it was quiet. And I keep on saying the bush can surprise – and guess what – I found fresh tracks of a White Rhino and we tracked and saw it. He was really big and the guests were all happy to see him. I was doing a Sunset drive on Rome 1 and we saw leopard killing a big female kudu. He was covered with blood – quite gory for some of the lady guests. When we come back the next morning we found a male lion eating the kudu and the leopard was gone – we really enjoyed the lion for about 3 days. 3rd October : As I entered the first boom gate at Orpen, a bull elephant was crossing the road. A mother and baby rhino were grazing further on and we also got a breeding herd of buffaloes. On H 7 road near Nsemani Dam we saw a mating pair of lions. On the S 100 we saw a cheetah hunting. 4th October : Along the Rabelais road we saw a HUGE herd of buffalo drinking water together with elephants. On the S 39 a leopard was drinking water and then lay on the road in front of us WOW ! After lunch on the S 127 we saw eleven lion cubs and three big males. 5th October : We saw a leopard hunting 10 metres from the road. Near Maroela two big rhino bulls under a tree and elephants with babies all over. 17th October : At Nsemani dam two big brother lions 50 metres from the road. H1 -3 near Kumana Dam two male cheetahs hunting and crossing the road in front of us. S 126 many lions – some were drinking water at the water hole and elephants came and chased them. 20th October : 3 Rhinos but far – 200 metres from the road. On S 41 at Gudzani Dam hippos and many big crocodiles. 25th October : We drove to Phalaborwa gate : At Sable Dam four big male elephants. Near Letaba on S 69 we saw buffaloes grazing. Between Letaba and Olifants on the river bed we saw many lions. 26 October : Cool weather, leopard with a warthog kill up a tree on H 7 and 11 lions near Phelwane. 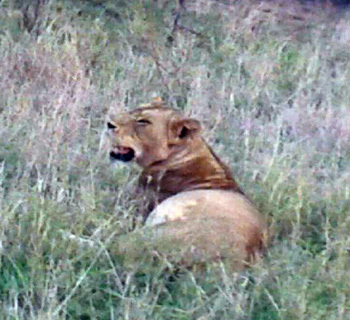 4th October : 3km from Orpen we found four female lions hunting a wildebeest. They almost caught him, but he got away, much to the relief of my guests. 8th : At Ngwenya dam we found three male lions lying down – their bellies were full. They kept rolling around and then one of them stood up looked at us. We were next to him about 3m then he join the other two. 7th : On Rome 1 we found a male lion with kudu which was killed by a leopard the day before. He took over the carcass and looks very old. 9th : On Rome 1 eastern cut line we had brilliant sightings: in two and half hours we found four of the Big Five – on the first drainage line we found a lioness crossing the road and hunting . Then we found a Black Rhino near some elephants and within 1km we found a herd of buffalo bulls ! 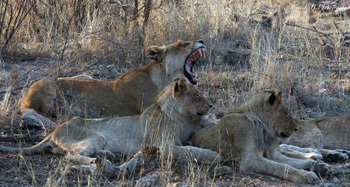 24th : On H 8 about 10km from Phalaborwa gate we found four lionesses hunting – one of them lay down next to the road. About 2 km from the gate we found a fantastic pack of 30 Wild Dogs on the road coming towards us – wow sighting ! Good day to all our Readers. It has been an interesting month with some unexpected sightings. Another Hot day since we are in Spring. At the Orpen gate we saw a male leopard next to the road. My guests were mesmerised – we viewed him for nearly 40 min. We then saw a breeding herd of Buffalo about 40m off into the bush lying down in the grass as the wind was blowing. On the H7 we got a lot of general game : loads of Giraffe, Ostrich with little ones, bachelor Buffalo grazing and the endangered Southern Ground hornbill. At Nsemani Dam we got a few breeding herds of Elephants coming down to drink water and Mud wallow and other animals including Crocodile, Waterbuck, Hippo and African Fish Eagle. What an amazing scene – seeing Africa Alive! On towards Satara for Lunch. 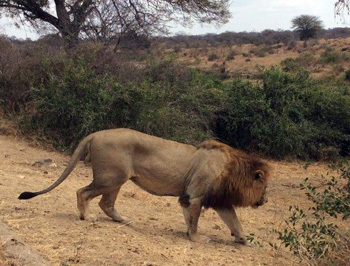 Afternoon drive down S100, getting confirmation about 2 male lions lying down – what a sighting ! On the H7 plenty general game : Martial Eagle, Plains Zebra, a troop of baboons up in a fig tree busy eating wild figs. Got a report of White Rhino – mother with a calf near Orpen so off we went to view these majestic animals. I always say these endangered animals are so unique and so special to view, since there are so few left. What a day in Africa it has been. The day begins early as we head North towards Phalaborwa. On the H9 going towards Sable Dam S51 we find Elephants. The day was one of the hottest day I’ve experienced in my 18 years of being in the area – phew ! We viewed more elephants as they drank water for about 15min and then went on viewing Waterbuck, Giraffe, Impala, a breeding herd of Buffalo lying down in shade as it was too hot to move (for them to conserve some energy). On the H 9 we viewed plenty of Bachelor Giraffes and a breeding den of Hyena in the middle of the day – quite unexpected. On to Letaba for lunch with a temperature of nearly 46 Degrees. After lunch went down H1-5 searching for lions. We found plenty of Elephants of all ages, Impalas, Waterbuck, Giraffes and Hippos. Already late afternoon driving on the H9 back towards Phalaborwa gate just in front of the S132 we spotted 3 big Lionesses – our luck came as it was starting to cool down a bit. They stood up and walked into wooded areas where we could see them clearly. About 5km from the gate, we got Wild Dogs – so endangered it’s always a privilege to see these amazing hunters. Incredible Month with the Cats! This month has been filled with sightings of Lion and Leopard; for about two weeks straight we managed to spot Lion every single day and even sometimes more than once a day; Leopard have been a little shy but I still managed to spot them 3 times in one month. On the morning drives we always spot the plains game.- this includes Impala; Kudu; Giraffe; Waterbuck. All and all it was still enjoyable and a great way to wake up! This month I have been doing Bushwalks most mornings and I must add that I absolutely love the idea of being able to walk in an unspoiled natural area and sharing all the finer details that Mother Nature has to offer to us – from the Nymph of the Lacewing ( the antlion) right through to the medicinal uses of the trees in the area. Our daily walks also include seeing the Hippos and Crocodiles next to the river nearly every single day. For the last two weeks the afternoon drives have been quiet as the temperatures were skyrocketing but we did manage to have an amazing sighting of a Male Leopard up in a tree giving us a beautiful show as well as multiple Lion sightings of them mating and cats just being cats lying around during the midday heat. I also had the privilege of meeting up with dominant Bull Black Rhino Zulu; we stumbled upon each other on the Rome 1 Eastern cut-line and before things could get a little heated, he sized us up and decided that he doesn’t mind us in his presence by continuing to feed right next to the vehicle. 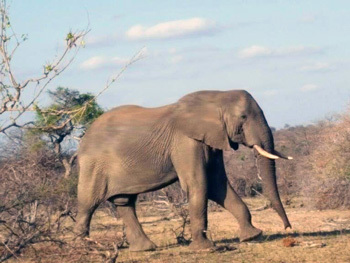 Elephant Sightings have been scarce but as soon as the rains return there should be an increase in elephant sightings. We managed to spot some elephant in the afternoon next to the Olifants River trying to make it through the midday heat. Once again it has been quiet but we did manage to get a beautiful leopard sighting – a female drinking water by River Lodge Cut-line and a beautiful female lioness on the hunt. We also spotted a mother lioness with cubs of about 1 year old and the experience was breathtaking. 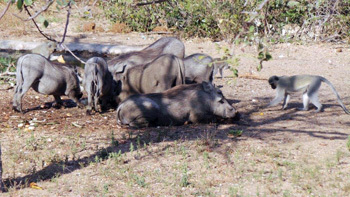 At Marula Boma itself we spotted a few Hyena; Honey-badgers and Porcupine. Overall an amazing month filled with new experiences – that with the Leopard that takes a very special place in my heart. I am glad that I can share these experiences with my guests and even on the quiet drives just get to know them and involve them in what Mother Nature has to offer. Sundowner drive we saw 2 black rhinos, elephants and a herd of buffalos. Bushwalk hippos and crocodiles out of the water and during sunset drive we saw 7 bull elephants near Marula and Masodini road. We spotted 2 lions at Ezulwini Beswani dam and 1 big lion at Barnards. During a bushwalk we also managed to see a herd of elephants, black rhino, hippo, crocodile, 6 giraffes, kudu, and a warthog. On another sunset drive we saw a herd of elephants at Kambaku dam, 4 lioness east of Ngwenya dam mobile west. Two bull elephants along Olifants road near Pondoro. Bush walk north of the river herd of elephants, hippos and crocodiles in the water at Olifants. Sunset drive 4 bull elephants at Campfire, 2 lions mating on Barnard airstrip. There were also lions mating at Ngwenya dam and elephants on Rome 1. Another Bushwalk a herd of buffalos Marula extension and on the walk 2 giraffes, zebra, hippos and crocodile. Sunset drive 1 lion with 2 lionesses at Ngwenya Dam. Bushwalk we saw crocodile in the water at Olifants. On the way back we saw 3 bull elephants on Marula road. Sunset drive saw 2 bull elephants and 5 lions and on our way back from Marula Boma we saw 3 of the lions sleeping. We managed to see 3 hyenas between Olifants road and Campfire. On the 2nd of the month in Kruger, the day was good but hot, sightings before reception 2 big male lions lying down and white rhinos. Buffaloes on S36 road and more general game S100. On the 9th lions on Rabelais road, buffaloes at Mudzandzeni picnic area, 2 cheetahs S126 and buffaloes and lioness with cubs on S100 and white rhino H6 road. On the 23rd lions before Nsemani dam, S100 buffaloes and elephants and Sweni general game. Rhino near Orpen. On the 27th S100 a big pride of lions : males, lionesses and cubs. Elephants, buffaloes on S100 Rhino on H6 and leopard on Sweni road. As a field guide working for Viva Safaris I feel so privileged and a blessed to operate in the central part of the Kruger National Park. There is so much to see and highly predated and a concentration of general game. This is the part of Kruger where I love driving. Orpen gate never ceases to amaze when it comes to big cats, Right now as it starts to get more greenery it draws so much general game which therefore influences the presence of cats. A very common sighting around Orpen is a male leopard which frequently makes kills. A porcupine was killed next to the road and dragged next to the near thick bush. It took almost two day to finish. The Orpen pack of Wild Dogs was seen a few times. The male leopard killed an impala which we found in the morning hanging in a tree, with the leopard lying next to the kill. It then jumped down on the ground and moved right next to the road and decided to lie next to my open vehicle ! I must be the MAN !!!. On another day a pride of 16 lions near Sweni water hole were busy setting targets when elephant arrived and chased them away. Lion going down to the river. Cheetah are more likely to be seen around Satara. There is a coalition of six moving together and they are very successful when it comes to making kills. There are another two cheetah hunting impalas near Phelwane bridge. Raymond and I went on a bushwalk, it was all very quiet, you have to know that it was the same area where 2 days before a leopard killed a female kudu and so the day before this bushwalk there was a big male lion that has stolen the trophy from the leopard. Raymond and I were then very vigilant as we didn’t had any clue where the lion was. We found his spoor, so we followed it after obtaining the consent of our guests but the lion had crossed over the river already – it was still very exciting to follow his spoor. Another morning Rex and I went on the bushwalk with our guests, and as we were walking on the river bank, we found a beautiful male giraffe busy feeding on a tree, about 15-20 metres away. He was very relaxed and very curious as is usual with these guys. He allowed our guests to take some selfies with him. That very same day, Rex and I were distracted long before we found that giant as we could hear 2 hippos fighting – it has been happening numerous times in the past 2 months. I think they are competing for pools as the river level is low. This month sightings have been absolutely amazing – on a particular day I took a dad and his daughter out and what a surprising morning. We did not find much apart from our impala (they can never disappoint you) until we reached the Olifants River. My guests pointed at a carcass. I swear that I wasn’t myself after that and we got very excited. It was a female kudu, so we started investigating, from what we could see the neck was perfectly broken with an arc shape, the soft parts around the bottom were missing as well as a massive hole on the right rib cage of that kudu where pieces of the lungs were missing. The eyes of this kudu were absolutely shiny as it just happened and the blood was still dripping like water out of the body. We turned around went back on top of a nearby hill and waited patiently for about 15 minutes. After that we rolled down the hill with Doris ( my landcruiser ), switched off so we would make less noise. When leopard have just killed their prey like most predators they require a little bit of rest to recover before they eat. As we arrived closer we got a glimpse of that beautiful male leopard. Absolutely monster, I mean beautiful but massive, massive enough to kill a fully grown female kudu. More often we find male leopards with kills like impalas or warthog but a fully grown kudu was my very first. I must say that lions don’t sleep at night, we had a brilliant month and I had the pleasure and privilege to do sundowner drives quite a bit, as it is my favourite drive. I took an awesome family out that day, we drove quite a bit and were not successful, so we decide to take a break for the « joujou » ( my luck ) I remember myself pouring the drinks and settling us all for a comfortable sunset behind the Drakensberg mountains when one of our mister lions decided differently. We heard that deep roar quite close, we packed everything in the car and climbed in the car. On the south western side of the Airstrip we found that majestic male lion lying down on the side of a termite mount, we watched him stand up and look around as he started walking away. He clearly had his mind set on crossing the airstrip form one side to the other. We then went and waited for him to cross on the road, and what an amazing thing, he crossed right in front of us. We then went back on the airstrips carry on with our drinks but this boy kept us entertained as he kept calling and his brother replied – they were trying to reunite. Wow !!!! This month I have also learned a new road, so one day I decided to try it during day time. About 500 metres on this road we came across a lioness and her 3 cubs. The cubs were about a year old. They allow us close enough to them and even though you could see they were hungry did not look bothered at all. They were peacefully doing what they do best : SLEEPING – we had such a great time with them as the light was settling down. Nothing better than Golden Hours. Having to be the first guide taking our new arrivals is usually a little tricky. People usually expect a lot from the first drive and trust me I understand I was once a guest as well. You’re usually so happy to be in Africa and think you’ll see everything at once. The reality is different, we won’t always be lucky. Unbelievably this month has been one of the luckiest months. I headed off in the bush after Shannon gave me one hell of a good news about 3 males lions sleeping on Barnards. We went straight there and found ourselves the only ones on the sighting – we enjoyed for about 10 minutes then moved off to give the others a chance as well. This coalition of males have been walking side by side for some years already. It is safer for them to be the 3 of them instead of operating individually. Later on, we heard impalas snorting as an alarm call so I turned Doris around and made my way toward the noises – we had a glimpse of the lionesses, then we saw them moving south, we went south and we managed to relocate them, I switched Doris off and the 2 lionesses crossed in front of our cruiser, we then left them in peace as we don’t want to disturb them. Later on that evening, I had my spotlight on we were driving on one of our main road when I spotted these 2 massive blueish – yellowish eyes, looking straight at us. Already I knew but I wanted to be 100% sure before I tell my guest what it is, as I got closer I got to see the beautiful spots – it was a female leopard We got to within 3 metres from her, we stared at each other’s eyes for a good few minutes and then she gracefully moved around the car and disappeared into the bush. That was the best leopard encounter in my whole life so far. A French lady loving Africa – thank you, thank you, thank you !! Katekani Tented Lodge has had a record number of bed nights this month. We believe it is really excellent value for money. 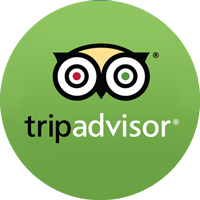 To date, our EXCELLENT ratings ( 5/5) on Tripadvisor are over 96% ! Well done to Charl, Margrett , Henry and the crew. A regular visitor to the Boma at night is a small-spotted genet that is clearly used to human presence. Tremisana Game Lodge has had a face lift. Our full time carpenter, Santos, has painted all the woodwork in the camp. 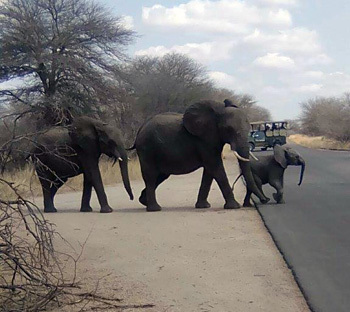 The rains have kept away and there is a busy daily thoroughfare of general game on the way to and from Tremisana Dam. 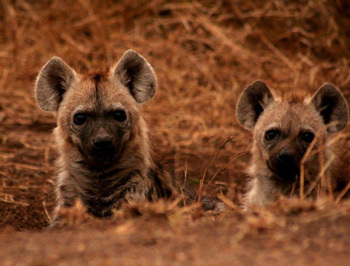 We have also noticed an increase in hyena sightings and think that there is a den somewhere on the property. Marc’s Treehouse Lodge has had great animal presence. The young Black Rhino is seen daily and it is amazing how docile he is. He clearly sees human activity as no threat to him and our guests have been treated to a fairly unnatural interaction with Black Rhino. The lions are also active and have killed a few nyala but generally run when they see humans. Thanks again (I need to say this every month) for your fantastic support. I hear from other operators that there has been a slowdown in October 2017 but we have not experienced this – because of your sustained loyalty and support. Of course with well over 450 guests this month, there have to be the odd complaints from unhappy guests. The main hassle is late pickup on day 1. Please understand that we are at the mercy of other factors beyond our control such as taxi strikes, heavy rainfalls and sometimes downright rude guests. I recall an incident over 25 years ago when I had to pick up an Italian gentleman from the Sandton Sun and had other guests to collect at a hotel near the airport. The Italian guy (incidentally from Piedmont from where my forebears came) insisted on offering me a coffee and explained that he was on holiday and had on purpose removed his watch. So of course the airport hotel people (Germans, who in any case, have a better concept of punctuality than Italians) gave me a proper roasting !! We collect our guests from their homes/hotels/hostels precisely so as to minimise the chances of theft/mugging etc so please be patient. Viva Safaris has a strong bond with Ezulwini (Laurence Saad and I know each other since the 60’s) and we are pleased to advise that all standard rooms have been upgraded. I shall be advising of a new product and pricing in the next newsletter. Ezulwini vehicle close encounter with the King. Everything about Viva Safaris and Tremisana Lodge was wonderful. We did the 4 days 3 nights at Tremisana. This is not a pretentious luxury lodge but rather a laid back friendly “regular” people atmosphere. I loved it!! The rooms are very clean, and the beds are comfortable, and we were very happy with them. We didn’t come here to hang out in a room and they kept us so busy with game drives, we really only showered, slept then on to the next adventure. The first night we went to Marula Boma for a braai under a sky full of stars, this was an experience I will never forget. Other meals at the lodge are home cooked and delicious, especially the buffalo stew – Yummmmm. At meal times the guides eat with the guests – this concept is so brilliant! I really enjoyed this as it gave us a chance to chat and get to know our guides and made the whole experience much more personal – like we were visiting with friends. Balule has a lot of animals. Along with many game animals, we saw lions, hyena, buffalo, hippo’s, crocodile, giraffe and a lot of elephants. Spectacular!! Balule also does not have the traffic that Kruger has, so most times it’s just your safari vehicle and a herd of elephants. Wow. Now, for the BEST part about Tremisana — the guides. Our guide, Elias made our trip so memorable. He is friendly, funny and passionate about the animals and the bush. He is professional and very knowledgeable, we felt safe with him at all times. At first I was not that excited about the bush walk, but Elias made it fun and we learned a lot and turns out it was one of my favorite things. In conclusion, Tremisana lived up to all of our expectations and it was a great value for our money. I do, however, have 1 complaint — it’s not with Tremisana or Viva but with my fellow travelers not tipping their guide. These guides do an amazing job and go out of their way to find animals and I noticed most people did not tip them. That’s just messed up!!!! TIP YOUR GUIDE!!!!! Recently spent 3 nights of our honeymoon at Katekani, and 1 night in the beginning at Tremisana – all run by Viva Safaris. The entire experience was perfect, and exactly what we hoped for. All of the employees are fantastic, and always a pleasure to speak with. Everyone was very informative explaining everything we saw, and had lots of patience with all the pictures everyone was taking. Special shout out Eva, Charl, and Niko for making this a memorable vacation! Also – the pictures do not do this place justice. The room was way bigger than we thought, and the overall grounds were perfect. At the beginning of September 2017, I have spent, together with my daughter, 5 unforgettable days in Treehouse (our house was no.2). Your staff is out of the world: Victor, Andy, Ed, Richard, Raymond, Elias, Patrick, Shannon and others – all of you are great guides and instructors. We learned a lot about animals, their behavior, trees and how to survive in a bush/savannas. Your Lady prepared fantastic soups and she kept monkeys away from our meals! Great experience in treehouse – one morning, about 5am, going from the toilet I was ‘charged’ by rhino – he was two meters from me trying to communicate with me!!! The same morning my daughter spotted from our deck two lionesses; later we heard from the staff that they broke apparently to the reserve – she was first to see them!! 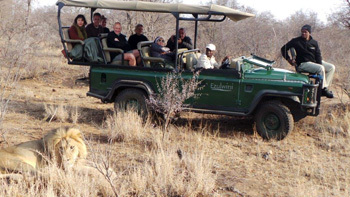 Game drives – very interesting with guides spotting so well animals – we have seen big five few times. Definitely, we will come back one day, and we recommend this experience to all our friends in ‘cold’ Canada. Thank you very, very much! Chap, chap!